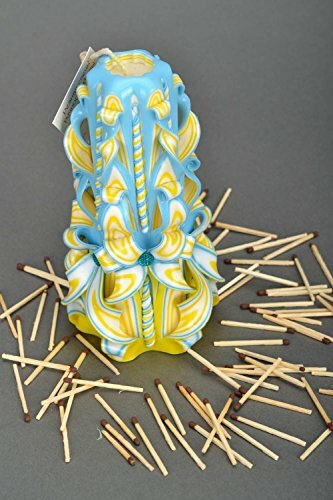 Large Carved Candle ''Blue And Yellow'' by MadeHeart | Buy handmade goods at Home Decor Outlet Store. MPN: unknown. Hurry! Limited time offer. Offer valid only while supplies last. Large candle is made of natural wax. The product is decorated with carvings and handmade beads. This bright candle looks very beautiful and unusual. DETAILS - Large candle is made of natural wax. The product is decorated with carvings and handmade beads. This bright candle looks very beautiful and unusual. It will be a wonderful decoration of a living room or bedroom. Just put it in a prominent place. If you want, I can make a candle with another smell.